A summer’s day with a kitchen garden. Gado gado variant. What could be more satisfying, frustrating, and completely fulfilling as a day spent between vegetable patch and preserving? I’m sure the majority could think of lot’s of things but I’m know I’m not alone in thinking it nigh on the perfect day. From an early trip to the farmer’s market, I launched straight into bottling peaches, peach salsa and plums. Seedlings and seeds were planted. Mulch spread and weeds pulled. Kilograms of silverbeet was washed, chopped, blanched and frozen. Very busy bee and productive. The resulting clean up was most intimidating. All this squirelling away of food for the cooler months did not allow much time to prepare a meal for the present. Which suited my desire for a satay style meal. 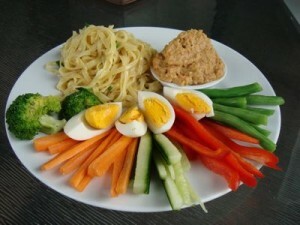 We had a nice meal gado-gado-esque meal with garlicky-spring oniony noodles on the side. The satay sauce was a combination of 1 cup peanuts, half cup leftover peach salsa, a tablespoon of fish sauce and a tablespoon of soy sauce. all whizzed together in the thermomix for about 10 seconds on speed 8. Thoroughly delicious. Dani, you are a veritable hurricane! That stash of bottled goodies must be a hugely satisfying achievement. It looks absolutely bloody marvellous. Did those tall bottles previously contain organic milk? If so, that’s a great use of them. We buy Elgar Farm products in those glass bottles, but we return them to the store for about 30cents per bottle, (they send them back to Elgar Farm for reuse). But I may hold on to a few and make my own pasta sauce as they are such a great size. That dinner looks right yum. I s’pose I could sub the peach salsa for tomato? Although I am planning to have a go at that peach salsa recipe. It’s too good. Docwitchs last blog post..December in Review. Well noticed! They are Elgar Farm bottles. I’ve been stashing them for awhile now much to the Bread Winner’s disgust. I’ve told him that when all the summer growth is done I’ll surrender the remainders back to the farm. Mine have been in the freezer, heat processed and all sorts of shenanigans and they seal brilliantly. I would think you could sub tomatoes for immediate use, not sure if that would be kosher for canning. Although on the same page of Shibaguyz blog as the peach salsa is their tomato salsa recipe. I haven’t tried it yet but I’m looking forward to trying it! Gado gado sauce with peach salsa sounds heavenly! I am most impressed with your canning prowess. Thanks Nate. I had a vision for this summer and canning. So far so good! The satay worked really well. The gado-gado is another winner. LOL – last xmas I made some when my mother came over and she said she wouldn’t like it, until I told he it was peanuts and she devoured it. If it had peach slas then it would have gone ever quicker. Peanuts are such a perfect food aren’t they? Unless of course you’re allergic. I love the colors on that plate. Summer food is the BEST. I’ll definitely try this, I’m not good in making this one but I am planning to give it a try again. My gf will surely love this. I love your site and I’ll be here often, keep it up!! Btw, happy valentine day to you! !